GE’s DT series of dead tank circuit breakers are characterized by advanced self-blast interrupters, leak-resistant, cast aluminum enclosures and durable, low-energy spring-operated mechanisms. 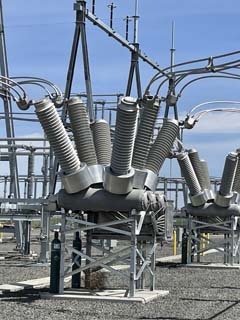 More than 100,000 circuit breakers with self-blast interrupters and FK spring-operated mechanisms have been in service since 1989. 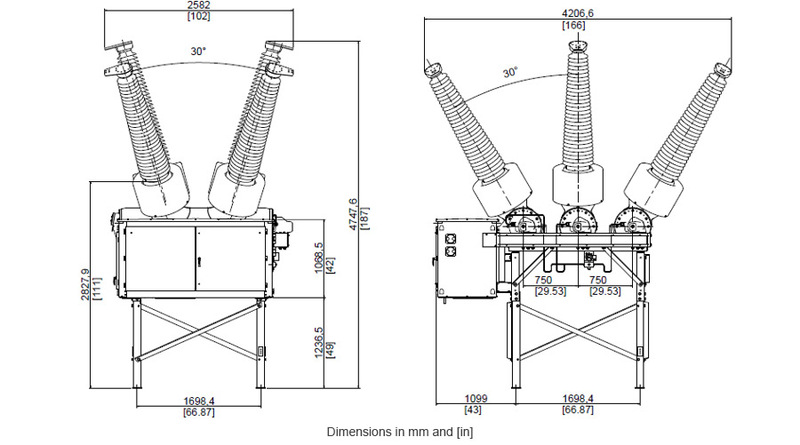 The DT1-245P 63 is available for single pole or for the three-pole gang operation. By utilizing tank heaters, the DT1-245P 63 can be installed in regions with temperatures as low as -60 °C. The field-proven interrupter chamber with double-motion technology utilizes the energy-optimized, self-blast principle which dramatically reduces the mechanical stress in the chamber, enabling a higher interrupting capability with a lower operational energy requirement. The reduced energy requirements within the breaking chamber allows for the utilization of GE’s world class FK spring-spring mechanism. The combination of the proven FK drive mechanism and interrupter technology results in a significant reduction of reaction forces, thereby reducing foundation design requirements. GE leads the industry in SF6 gas tightness testing technology including seals, castings, and plumbing systems. Each breaker is factory tested using GE’s proprietary gas tightness testing system which provides measurable, quantifiable test results on the breaker in its fully assembled, as-shipped condition. GE designs, manufactures, tests and delivers its circuit breakers in accordance with the latest IEEE/ANSI and IEC standards, maintaining a quality assurance system according to ISO 9011 and ISO 14001 certifications. The center of excellence for dead tank circuit breakers is located in Charleroi, PA (USA), where dead tank circuit breakers up to 550 kV and live tank circuit breakers up to 800 kV are assembled. The production lines feature high degree of domestic content, which can help to facilitate compliance with national requirements. In addition, the complete wiring and assembling of low voltage control cabinets and mechanism cabinets is done locally, resulting in greater flexibility to respond to utility needs. The DT1-245P 63 model is factory tested and prepared for shipment with bushings assembled and prefilled with SF6 gas. As a result, the on-site installation requires only a few simple steps without requiring any special tools. The DT1-245P 63 circuit breaker range has lower maintenance costs and requirements owing to an engineering and design philosophy that has focused on these key needs since the inception of the development process. *Special purpose, high TRV, high X/R or other rating requirement are available on request. Please contact GE.